Ahmedabad is one of the major cities in India and it is also one of the few cities that has a combination of older and modern suburbs. When it comes to staying in Ahmedabad, you have a large variety of options. Whether you want to fulfill your wish to live in an ancient haveli (mansion) type of house or a modern luxury hotel, Ahmedabad will satisfy your desires, for sure. Located in a posh satellite area, the Courtyard Marriott is truly a world class hotel, right in the center of modern Ahmedabad. The hotel offers a pool, gym and a wide range of dining options. It features classic and spacious rooms, with a flatscreen TV, work desk, air conditioning and many other amenities. With a 24x7 coffee bar to cater your coffee needs, you will definitely not miss your international online meetings. This is the cheapest option in Ahmedabad and we’re not kidding! This cozy room is 12 USD night. It’s very modern and located in the posh Prahaladnagar area of Ahmedabad and is a must-stay place for couples or solo and business travelers. A huge terrace garden, attached to the room makes it stand out as unique. The view from the terrace is amazing and definitely breathtaking. Homestay with private terrace garden, Prahaladnagar, Ahmedabad. 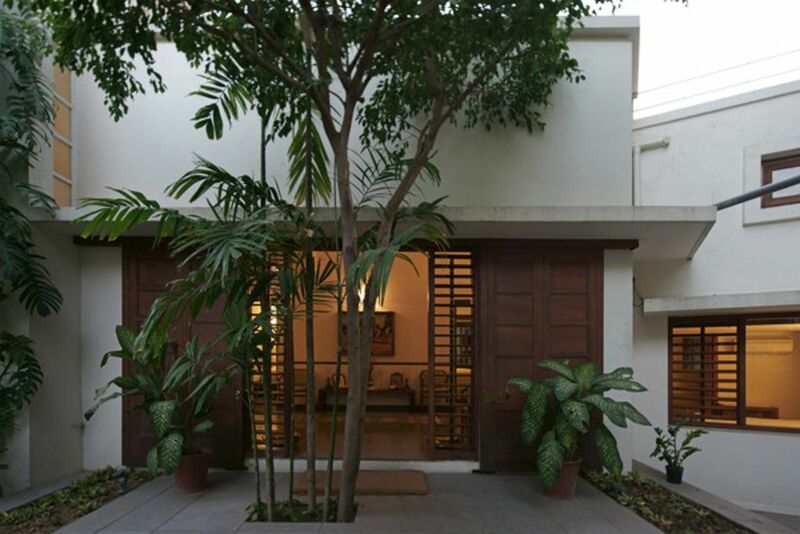 The House of MG is the most distinct and charming accommodation option in Ahmedabad. The hotel offers spacious rooms, with alluring and classic interiors. The hotel also has an indoor swimming pool and on-site gift shop. House of MG is located right in front of Siddhi Sayed Jali, one of the most famous landmarks in Ahmedabad. The dining option on MG’s terrace restaurant, Agashiye, will revive your senses and the unique interiors of the entire hotel will surely take your breath away. Dodhia Heritage Suite is a marvellous, 150-year-old Gujarati haveli (mansion) and it has the most breathtaking interior. This classic suite offers a private balcony and terrace. With modern amenities, such as a refrigerator and air conditioning, this place offers a caretaker to cook fresh breakfast for you! A perfect place to spend quality time with your loved ones, Dodhia Heritage Suite is an extraordinary experience to cherish forever. Located near Gujarat College, Ellis Bridge, in the western suburbs of the city, the Four Points by Sheraton offers world class service, for tourists and visitors in Ahmedabad. The four-star hotel has a fitness center and coffee shop and the room has a minibar, TV, and a rain shower in the bathroom. With a beautiful interior and spacious rooms, this hotel is the perfect option to relax, after a busy day touring the city. Sitara, is a truly exceptional option if you’re looking to stay amidst nature. It is the perfect getaway option to relax from the busy hustle and bustle of the city and it is located on SG Highway, in the western suburbs of Ahmedabad, a half hour drive from the city centre. There is a large living room, dining area, kitchen and a huge bedroom, which overlooks the entrance. One of the unique aspects of staying here is the frequent spotting of peacocks, monkeys, dogs, nilgai, cats and squirrels. Apart from that, the star gazing at night will surely give you a spectacular view! This house gives the vibe of staying in a French mansion. Not exactly a French mansion, this old Indian haveli is renovated in a unique French style. Chabutro is a tree house, which gives it a unique, three-sided, open perspective. It offers a single bedroom and a shared bathroom on the ground floor. The room also has a private study on the ground floor. Located in an older suburb of Ahmedabad, you will experience the true Ahmedabad vibe, by staying amongst the locals here. Chabutro, Older suburbs, Dhani ni Pol, Ahmedabad. If you are planning to stay for a longer time in Ahmedabad and want to rent out an entire apartment, you should definitely book this luxurious apartment, in Maninagar. Located close to the famous Kankaria Lake and Maninagar Railway Station, this house offers three bedrooms, two bathrooms, and a spacious living room. A huge kitchen to make your food and a parking area for your own car are also offered in this apartment. The apartment is close to markets for groceries and restaurants. Luxurious getaway home, Maninagar, Ahmedabad. Have an unforgettable experience in Ahmedabad! As you see, Ahmedabad offers all kinds of accommodation. With options to stay in the older suburbs, with havelis designed in mansion style and world-renowned hotels, Ahmedabad will never let you down. Head on to the websites mentined here and book your rooms today!